I am a member of the Collective Bias® Social Fabric® Community. This recipe shop has been compensated as part of a social shopper insights study for Collective Bias and their client. The other day I was shopping at my local Walmart for some much needed groceries. I had printed a coupon (no longer avail.) for the new Land O'Lakes Saute Express Saute Starter and decided that these would be a great help. The Saute Express comes in 5 different flavors: Italian Herb, Lemon Pepper, Teriyaki, Savory Butter & Olive Oil, and Garlic Herb. I picked out the Garlic Herb and Italian Herb flavors to take home. Each flavor comes along with some quick dinner recipes right on the box. When I got home I unloaded my van and got to cooking for supper time. I have a long time family favorite recipe that I have been making for many years called Fontina Asparagus Tart. My tart recipe has won some cooking contests and even has been published in a magazine. It's the most simple recipe to make and it tastes phenomenal! 2) rinse the asparagus and then cut the bundle in half. You can discard the end stalks but I always make mine into cream of asparagus soup so as not to be wasteful. 3) place the top half of the stalks into the pan with the melted butter & olive oil Saute Starter that should be completely melted. Toss the asparagus around to coat and then saute them for about 5 minutes. Flip the asparagus around at least once per minute so they cook evenly. Once it is just slightly cooked then shut off the burner and let it sit. 4) while the asparagus is cooking there is time to get out the puff pastry. Lay out one sheet of the pastry onto a nonstick sheet. I like to line mine with parchment paper to prevent scorching the bottom. Cut the parchment on the folds into three equal pieces. Space the rectangles of pastry out on your sheet and then bake for 10 minutes at 425 F. We want the pastry to puff up and turn lightly golden. 5) while the pastry and asparagus are both cooking take out the fontina cheese and shred about 4 oz worth. I like to use the large side of my box grater. I grate my cheese out onto a plate and then stick it in the fridge until I need it so that it stays chilled. 6) Once the pastries come out from being half baked they will be puffed up. Sprinkle on half of the cheese and then lay the asparagus diagonally over the pastries and then sprinkle on the other half of the cheese over that. 7) Squeeze half of a lemon over the three pastries and then add a bit of salt and pepper. You will want to go really sparse with the salt since the cheese and the butter are already pretty salty alone. 8) Bake for an additional 10 minutes. We want the cheese to be bubbling with a hint of golden brown on the pastry. The asparagus should be tender. Let it rest for about 4-5 minutes and then cut into triangles or squares to plate and devour! *Hint to the chef* Be sure to squirrel away a slice or two for yourself because these tasty slices fly off the plate faster than greased lightening! 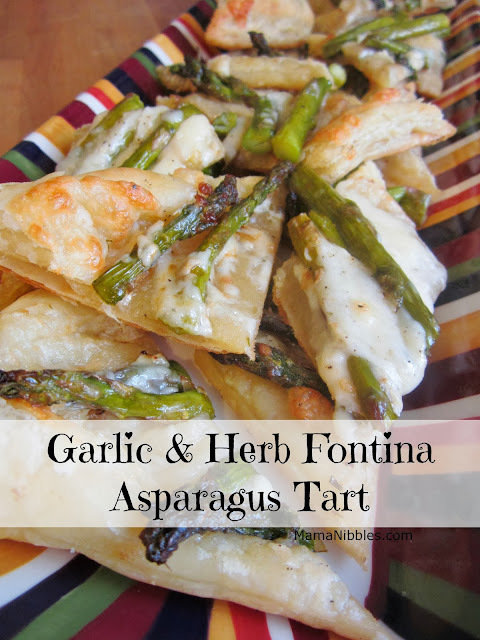 The garlic herb flavor from the Saute Express goes really well with the fontina and asparagus. I think that next time I make this super yummy appetizer I will try using grilled chicken and the Italian Herb saute starter. I bet it would be a really easy chicken dinner recipe. I love these new little squares from Land O'Lakes! They are so easy to use and boost the flavor of any dish.